Being a cowboy means tackling any task necessary to handle any job before him. 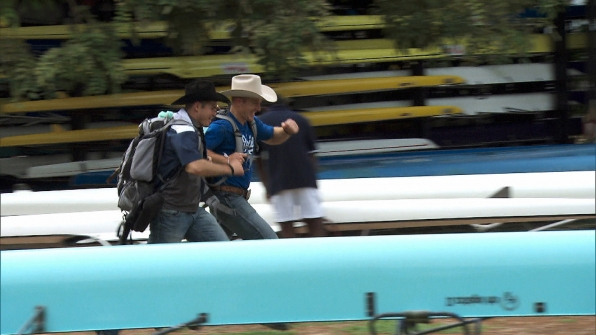 That philosophy came in quite handy for Jet and Cord McCoy during the fifth leg of “The Amazing Race” All-Star Edition, which was broadcast Sunday, May 23, on CBS-TV. The ranch-raised brothers from the southeastern Oklahoma community of Tupelo overcame traveling obstacles, a fishing adventure and a sewing machine to finish in third place and continue the race around the world for $1 million. The McCoys were the first team in the fifth leg of the race, which began in Kuala Lumpur, Malaysia, leaving 47 minutes ahead of the second-place team, the father-son tandem of Dave and Connor O’Leary. The eight teams were directed to a travel agency, where they were to find a flight to Colombo, Sri Lanka, to continue their chase for the big money. That’s true. The high-stakes scavenger hunt means overcoming all the obstacles, and the first is travel. The first six teams in the race earned the first direct flight from Kuala Lumpur to Colombo at 11 p.m., while the final two had to scramble to make their way along their trail. “(In) this race, the travel can make or break you, by far,” Jet said, who, like his brother, learned to improvise his travel arrangements as needed as The Cowboys made their way from one rodeo to another in a lifetime filled with high-level competition. Travel trouble struck the final two teams, newlyweds Brendon Villegas and Rachel Reilly and the mother-son team of Margie O’Donnell and Luke Adams. Since they were unable to make the first flight, Villegas and Reilly scrambled and took a riskier move to connect through Singapore, while O’Donnell and Adams hoped to increase their odds on standby. The Newlyweds left Kuala Lumpur first, then rushed to make their connecting flight in Singapore, arriving in Colombo first. They made it to the Gangaramaya Temple first, but quickly found out they had to wait until the temple opened several hours later at 5:45 a.m. That allowed all six teams on the direct flight from Kuala Lumpur to catch up. Once each team member was blessed by Buddha monks, they made their way by train to King Coconut Stand in Galle, Sri Lanka, to receive their next clue. That meant the first seven teams were on the same train together, which allowed the country singers, Jennifer Wayne and Caroline Cutbirth, to reveal their fascination for The Cowboys. “We like to be near the cowboys because they’re magical,” Cutbirth said. “Any of the magical powers we can get, we’re trying to rub it off on us. The coconut stand revealed only a clue to the leg’s Detour, which allowed the teams the option of either fishing handling a complicated local dance that included spinning plates. The McCoys opted for fishing. Each team member had to catch one fish. The O’Learys were the first to accomplish the feat, while the McCoys were second. The Globetrotters, Herbert Lange and Nate Lofton, and The Afghanamals, Leo Temory and Jamal Zadran, were the first done with the spinning. Once done, the teams were directed to the Road Block at the Trendy Connections Garment Factory, where one member of each team was to sew a shirt together. Jet handled the assignment for The Cowboys. “I’ve never sewn before,” he said. “It’s worse than a puzzle, because all of the puzzle pieces are moving. He made it relatively quickly, and the Oklahoma brothers were on their way to the Pit Stop. The O’Learys won the leg, followed by Wayne and Cutbirth. Jet and Cord McCoy were third. O’Donnell and Adams, whose gamble on standby put them several hours behind the other teams leaving Kuala Lumpur, were well behind the pace through the episode and finished last. They were eliminated from the reality TV show. That means the McCoys are one of just seven teams continuing the race around the globe.